Please write a description of what is wrong and what you would like done. If you have photos to assist us with the repair upload them below. 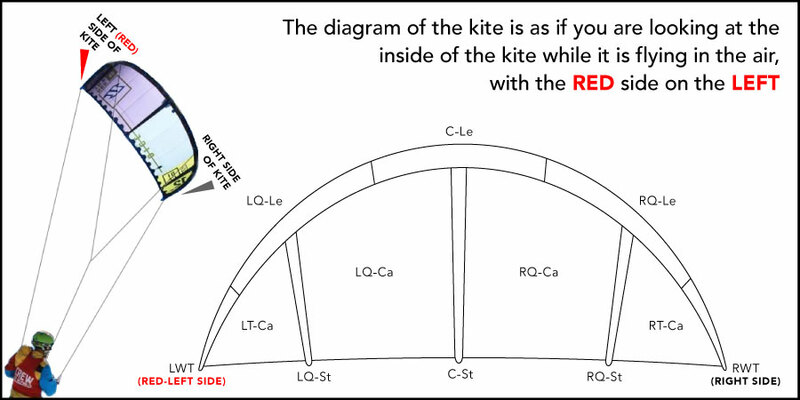 Select the areas where there are issues (the codes relate to the kite diagram). Please give a clear description of where the issues are on your kite. To describe left and right side please consider left as the 'red' attachment point of the kite, as if you are looking at the inside of your kite while it is flying in the sky. Do you need the item to be sent back to you once the repair is complete? Unless a fixed price has already been agreed upon we will contact you with an estimate of pricing before we start the repairs. – Kites need to be supplied clean and dry or they will incur an extra $50 cleaning fee. A list of approximate prices for repairs can be found here. (however this can be longer if there is an increased workload, it is a complicated repair, or the repairs require additional parts to be ordered).